As a patient at Springfield Orthopaedic and Sports Medicine Institute, you can receive all the diagnostic and rehabilitation services you need within minutes of our offices. 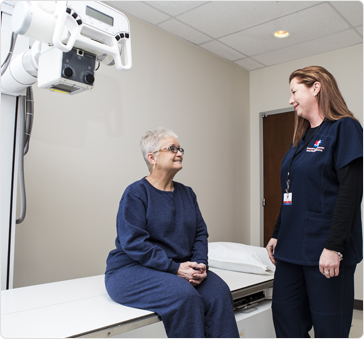 With locations on the campuses of Ohio Valley Surgical Hospital in Springfield and Mercy Memorial Hospital in Urbana, you are within walking distance of many on-site facilities, saving you the hassle of spending time and money travelling across town. When orthopedic trauma occurs, a digital X-ray is typically the first step in understanding the severity of the injury and how to best proceed with treatment. X-rays show images of bones. For patients with joint pain, we may order an arthrogram, which is a digital X-ray of a joint that uses a contrast material such as dye to obtain a clearer image of the soft tissue structures within your joint, such as tendons, ligaments, muscles, and cartilage. MRI is commonly used to diagnose orthopedic injuries and sports medicine conditions when an X-ray is unable to provide enough information for a proper diagnosis. Orthopedic doctors use MRIs to evaluate injuries to ligaments, tendons, cartilage, and muscles. We offer the convenience of a campus environment at both locations so you do not have to travel for surgical services. We are located directly next to hospitals in Springfield and Urbana, where our orthopedic surgeons perform both inpatient and outpatient surgery when necessary. We often refer our patients to physical therapists as part of your treatment plan and work closely with them during your recovery process. People who have had orthopedic surgery and those suffering from workers’ compensation injuries, automotive injuries, sports injuries, chronic injuries, and other trauma can benefit greatly from physical therapy. We offer the convenience of on-site PT managed by a trustworthy physical therapy practice. To schedule an appointment with one of our talented orthopedic specialists, please request an appointment online or call us at (937) 398-1066 today.